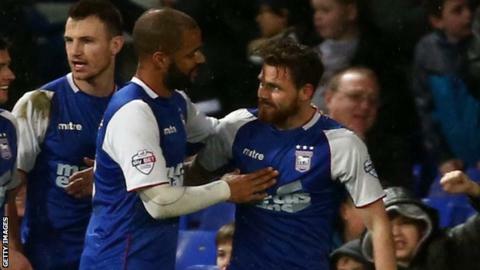 Ipswich Town midfielder Paul Anderson believes the Championship promotion contenders will be able to fend off interest in their best players. Striker David McGoldrick and defender Tyrone Mings have attracted attention for their performances this season. Anderson told BBC Radio Suffolk: "I know the owner is behind us and can afford to turn down whatever offer. "I'm sure the owner and manager will be desperate to keep the squad together and maybe add one or two." Town rejected an offer from Leicester City in the summer for striker McGoldrick, who scored 16 times last season and has been on target six times this term. And the Portman Road side have had to dismiss a bid from Crystal Palace for defender Mings, who has reportedly been watched by Arsenal. The pair have been among the headline performers in a successful first half of the season for Town. Mick McCarthy's side have lost just once in their last 17 league games and are one point behind leaders Bournemouth. "Everyone was after McGoldrick last year, Tyrone has been amazing this year. They deserve every bit of credit they get," said 26-year-old Anderson. "Whenever somebody performs, there is going to be speculation. "I wouldn't be surprised if there are a couple of additions in January as well - not that I know anything."